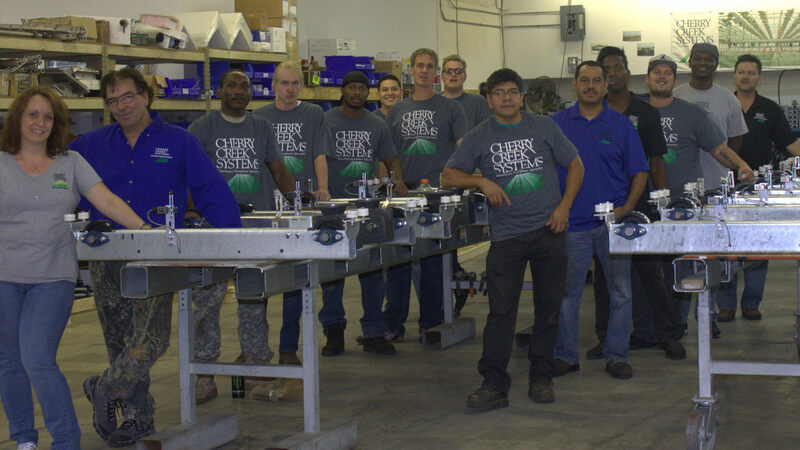 Cherry Creek Systems was founded in 1984 as a manufacturing company of quality greenhouse irrigation systems and automation products. The company, originally called East Coast Designs, was started by Arie Van Wingerden in his home town of Pipersville, Pennsylvania. As a grower and greenhouse owner himself, Arie was always looking for a way to grow better plants while reducing labor costs. At the time, the practice of growing hanging baskets was very basic, and utilizing drip systems was the best way to produce them efficiently—until Arie created the first automated hanging basket irrigation system, later named the ECHO, for his own uses. Thrilled with the results, Arie continued to develop the ECHO greenhouse irrigation system into something that could be replicated and sold to other greenhouse operators. Once the ECHO started to gain interest in the greenhouse industry, it only seemed natural to build a business around it and develop other automated products, such as irrigation booms and conveyors. East Coast Designs was born. Thirty years later the original ECHO and Boom greenhouse irrigation systems are still in operation, still providing increased plant quality and labor savings. In 1994, after creating the company and developing multiple successful products, Arie decided to move the company to Colorado Springs and change the name to Cherry Creek Systems. He brought his family west to seek new opportunities as a greenhouse owner. He bought land in beautiful Larkspur, Colorado where he built a new greenhouse and manufacturing facility. As he spent time building the new greenhouse business, Arie put a few key people in charge of running Cherry Creek, including Jake Van Wingerden, Aries’ oldest son. Jake helped build Cherry Creek Systems into a thriving business and continued to drive the success of the company, setting it apart from anything else like it in the greenhouse irrigation industry. Most of the growth of the company came from customer demand—growers always wanting something slightly different than the current line item offerings. Consequently, design and innovation became the driving force of Cherry Creek Systems, propelling it to the front line as the leader in greenhouse automatic watering. After 30-plus years of industry leadership, over a dozen innovative products, and 50+ million dollars of sales logged, Cherry Creek continues to thrive and hold the top position in the US market of automatic watering products for the greenhouse and nursery industries. Today Cherry Creek remains in Colorado Springs with cutting-edge greenhouse irrigation systems and a focus on customer service and support. With a mindset of striving to be the best in automatic watering for greenhouses, Cherry Creek continues to create, develop and innovate products, such as the Step, Stop Water Program, for the grower of today using customer feedback and grower inputs to make improvements to their best-selling automatic watering products.